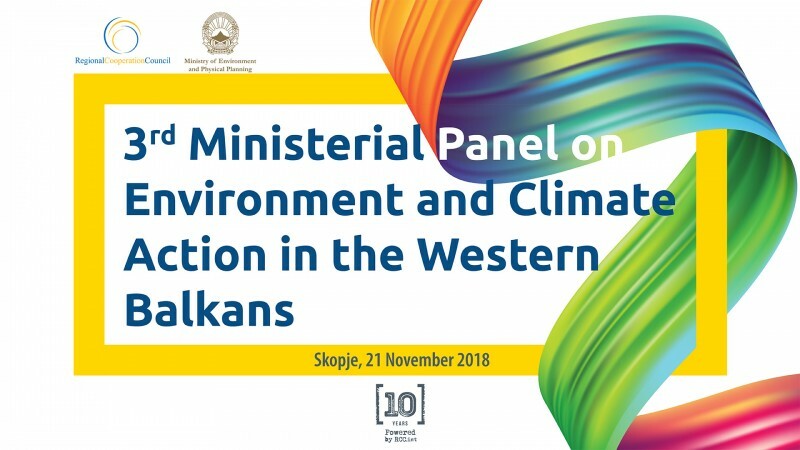 Skopje – The Regional Cooperation Council (RCC) is organising the 3rd in row Ministerial Panel on Environment and Climate Action in the Western Balkans, which is to take place in Skopje tomorrow. The event is organized together with the host Ministry of Environment and Physical Planning. The meeting is to take stock of the implementation of Bonn Ministerial Declaration, review the key regional developments in the area of environment and climate change, and discuss needs for strengthening future cooperation in the Western Balkans. The Ministerial Declaration, reconfirming commitments of the region to implement measures addressing the environment protection and climate change, is expected to be endorsed. The Ministerial Panel will be opened by the hosts, Sadulla Duraki, Minister of Environment and Physical Planning, Goran Svilanovic, RCC Secretary General, and Nicola Bertolini, Head of Cooperation at the Delegation of the European Union in Skopje, followed by the key note addresses by Janez Kopac, Director of the Energy Community Secretariat, and Gabriele Janezic, Deputy Head of Mission and Consul of the Austrian Embassy in Skopje. After the opening ceremony the RCC Secretary General Svilanovic will moderate the ministerial panel, tackling regional environmental and climate challenges and coordinating Western Balkan’s regional activities in the future, in light of 2030 energy and climate targets.